Mini projects for engineering students gives an edge over the race of recruitment to work hard to ensure a good career. The importance of making mini-projects cannot be over stressed, experts say. In spite of employment practices in recent times, students are progressively taking up mini-projects to pad up their skill-set, they add where students have been placed in their third year before the final-year project. 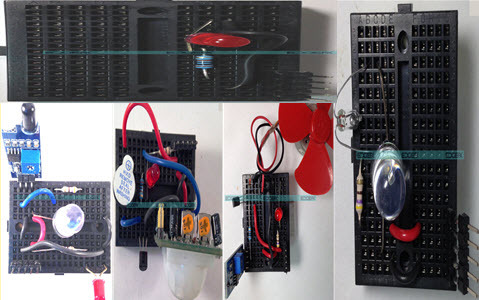 By doing electronics mini projects, students can gain practical knowledge. In spite of theory concept you acquire, various industries also need to know your capacity to complete projects using your specific initiative. So, we recommend students do mini engineering projects in their four years of engineering and try to present as many white papers as possible in the engineering third year. The following steps are the most important reasons why students should give more importance to mini projects. Are students using their mini projects in the proper way? Of course! But until they learn practically and apply it to design mini projects they can’t really say that they are using an advanced mini projects in the proper way. Indeed, making mini project is a portion of students’ academics, but how effectively, they are using it makes you stand out from others. Currently, engineering students showing an interest in making mini projects as they realize the value of practical training. But due to the software boom, until newly final year projects were not reserved seriously both due to the allowance given to them and also students had previously been employed by the time they came into the final year.And also, there are many students telling that with fewer internships, making mini projects students can gain practical knowledge. Mini-projects are helpful that they provide employers a chance to distinguish between students with related backgrounds. They also support students to show their talent and they might not have a direct effect on employment. Online mini-projects through different initiatives are attractive to engineering students, particularly in the Engineering department.But, more and more students favor working with professors straight as only a few students with lots of creativity can help from these essentially self-help kind of projects. Mini projects would definitely help students, but the very least students could do in their mini projects for eee 3rd year in engineering would be to work on these projects. Before applying many core jobs, students need to answer many technical questions. If they are not confident about the answers, then they need to think back to know what do companies require from the students. It’s not the knowledge that recruiters need from you but they require engineers who can be more creative and crack the technical or practical problems that arises. Resolving these industry issues is what make them a good engineer! In many articles, it mentioned less than 8% of Indian engineers capable for the roles of core engineering tells ambitious minds report.Further, it states that the governments make in India inventiveness will aim to make industrial capacity in India and produce 100 million jobs in the future but a deficiency of skilled engineers may obstruct the manufacturing capacity of India. It is expected that the lack of skillful engineers will be the source cause of Indian financial deflation despite creating a large pond of core engineers every year. This development has to change at a particular point where the core engineers must increase their productivity. Nowadays, students have a wish to study abroad for a masters or a research enthusiast. So, they should start designing their profile that is required to apply for any respected university.University ratings and marks are not the only reasons that influences the application for the master’s degree.Unlike bachelors degree which needs only a good percentage to get into it, for a masters degree or research you need to build your profile based on the project works you have done and your involvement towards the invention. And while writing SOP (Statement of Purpose) you can’t just fill it up with grades, you need to talk about the projects you have done and it is possible only when you learn and build projects. So learning and making engineering projects give more worth to your CV. When students actually learn and make electronic and electrical mini projects that actually work, it will offer them with a strong reason to talk in their profile and increase their confidence. This will also give them lots of recognition when they are working with documents while applying for masters. From the above information, finally we can conclude that the technical skills can only be improved by making mini projects. So students should utilize mini projects well, so that they will become more productive. Furthermore, any doubts regarding this concept or to implement mini projects for ece and eee students. Please give your valuable suggestions by commenting in the comment section below. Here is a question for you, What are bread board projects?